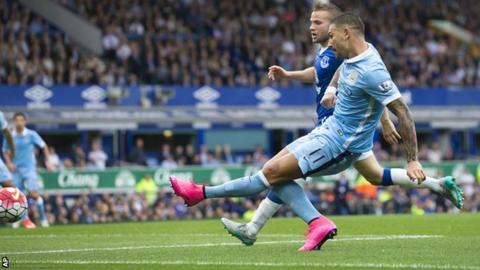 Manchester City maintained their flawless start to the Premier League season to go top of the table with victory at Everton. Aleksandar Kolarov and substitute Samir Nasri struck after the break to make it three wins from three for City, who have yet to concede a goal as they lay down another marker that they are determined to reclaim their crown from Chelsea. Everton, buoyed by a fine win at Southampton last weekend, gave City a real run for their money but David Silva had already hit an upright before Kolarov took advantage of poor goalkeeping from Tim Howard to take Raheem Sterling's pass and score at the near post on the hour. Romelu Lukaku glanced the bar with a free-kick for Everton at the end of an evenly-contested first 45 minutes but City's greater quality made the difference after the break and it was an uphill battle for Roberto Martinez's men once Kolarov had broken the deadlock. Vincent Kompany came to City's rescue late on when he cleared Gareth Barry's header off the line and the destiny of the three points was settled when Nasri played a neat one-two with Yaya Toure to lift a finish over the advancing Howard with two minutes left. City demonstrated their credentials with their comprehensive victory over champions Chelsea at Etihad Stadium last Sunday and this was just as impressive as they emerged unscathed from a potentially hazardous visit to Goodison Park. The average positions of Everton and Manchester City show how the visitors continued to attack with width. Both goals originated from wide areas. This was the sort of game where Manchester City were so often found wanting last season, caught short on trips to Liverpool and Manchester United - as well on visits to Burnley and Crystal Palace. There was a sense that Manuel Pellegrini's team were resting on their status as reigning champions and paid the price for complacency setting in. It may have been the loss of that title and the criticism that came with it but there was not a bit of complacency here as they came to Goodison Park, where they have struggled so badly in the past, and came away deserved winners. City showed strength as the back when required in the face of a very good Everton challenge, with Eliaquim Mangala faring much better against Romelu Lukaku than he did last season and showing he will not step aside easily for £30m new boy Nicolas Otamendi, and real class in attack. With Yaya Toure rejuvenated, Silva, Sergio Aguero and Sterling have licence to be expansive and after showing they could be a force at home with their dismissal of champions Chelsea, this was a real show of strength at Goodison Park, a ground where no-one has an easy ride. John Stones went into this game shrouded in speculation about his Everton future with Chelsea reportedly considering a fourth bid to take the 21-year-old England defender to Stamford Bridge having had a third offer of £30m turned down. It is easy to see why Everton insist he will not be sold - and why Chelsea will not go away in their pursuit of a player they see as the heir apparent to John Terry at the heart of their defence. Stones was easy on the eye, showing great composure on the ball and a willingness to mix it in the tackle that shows there is steel beneath the elegant exterior. He is still progressing, however, and it showed in one of two moments when his willingness to play his way out of trouble led to an anxious moment and also when he was involved in a mix-up with young Everton team-mate Tylas Browning that led to a chance for Jesus Navas. Stones showed enough elsewhere, though, to illustrate exactly why he is so coveted and regarded as a player with a glittering future for club and country. Sterling has hinted at why Manchester City were prepared to part with £49m to bring him from Liverpool in his first two games - here he showed exactly what he can add to Manuel Pellegrini's side. Sterling had to put up with inevitable jeers from Everton supporters as a former Liverpool player (although hardly a taste of what he will receive when he gets back to Anfield) but he played without a care in the world and was a constant threat. He had a fascinating battle with Everton right-back Seamus Coleman throughout the game and both emerged with credit, Sterling playing in Silva for a shot against the post then setting up Kolarov for his goal. Sterling showed pace, strength and industry to give City the width to get in behind Everton's defence in his before performance since his expensive switch from Liverpool. The Spanish magician was a constant source of danger from the first whistle with his brilliant close control and superb vision. Silva knits it all together for City and his link with Sterling and Sergio Aguero is rich in possibilities for City. He could have had a goal but struck a post with a thunderous shot but contributed enough elsewhere to make him City's main man again. Manchester City boss Manuel Pellegrini: "We have different pace with Sterling. It's a different way to play. It's important to have different things to do during the game. It's important to have a good squad because we play so many games in a season." Everton boss Roberto Martinez: "It's a little bit hard to take because I think we had very good moments. If we could get the first goal it would have changed the game. Overall I felt we didn't have that bit of luck you need in the six-yard box." Who's up next for both teams? Manchester City will hope they can continue their perfect start to the season when they face Premier League newcomers Watford next Saturday at Etihad Stadium before they travel to Crystal Palace after the international break. After Everton have travelled to Barnsley for a second-round League Cup tie, they will face an early test against one of their potential Europe-chasing rivals at Tottenham. The Toffees then host Chelsea at Goodison after the break. Corner, Everton. Conceded by Aleksandar Kolarov. Attempt blocked. Romelu Lukaku (Everton) left footed shot from the right side of the six yard box is blocked. Assisted by Gareth Barry with a headed pass. Offside, Everton. Romelu Lukaku tries a through ball, but Steven Naismith is caught offside. Substitution, Manchester City. Fabian Delph replaces David Silva. Goal! Everton 0, Manchester City 2. Samir Nasri (Manchester City) right footed shot from the centre of the box to the centre of the goal. Assisted by Yaya Touré with a through ball. Attempt saved. Jesús Navas (Manchester City) right footed shot from the right side of the box is saved in the top centre of the goal. Assisted by Yaya Touré. Substitution, Everton. Gerard Deulofeu replaces Tom Cleverley. Corner, Manchester City. Conceded by Seamus Coleman. Attempt missed. Yaya Touré (Manchester City) right footed shot from outside the box is high and wide to the left. Assisted by Bacary Sagna. Attempt missed. Gareth Barry (Everton) header from the centre of the box is close, but misses to the left. Assisted by James McCarthy with a cross. Substitution, Manchester City. Samir Nasri replaces Raheem Sterling. Corner, Manchester City. Conceded by Steven Naismith. Offside, Everton. Tom Cleverley tries a through ball, but Seamus Coleman is caught offside. Tyias Browning (Everton) wins a free kick on the left wing. Corner, Everton. Conceded by Jesús Navas. Corner, Everton. Conceded by Eliaquim Mangala. Attempt blocked. Steven Naismith (Everton) right footed shot from outside the box is blocked. Assisted by Ross Barkley. Corner, Everton. Conceded by Vincent Kompany. Attempt blocked. Ross Barkley (Everton) right footed shot from the left side of the box is blocked. Assisted by Steven Naismith. Corner, Manchester City. Conceded by Tim Howard. Attempt saved. Jesús Navas (Manchester City) right footed shot from the right side of the six yard box is saved in the bottom right corner. Attempt blocked. Arouna Koné (Everton) left footed shot from the centre of the box is blocked. Assisted by Tom Cleverley with a cross. Goal! Everton 0, Manchester City 1. Aleksandar Kolarov (Manchester City) left footed shot from a difficult angle on the left to the centre of the goal. Assisted by Raheem Sterling.